What are you thankful for? Is it a list of 'things' that cater to your fleshly desires? Is it your car, your house, your iPhone, your wardrobe, your girlfriend, your boyfriend? 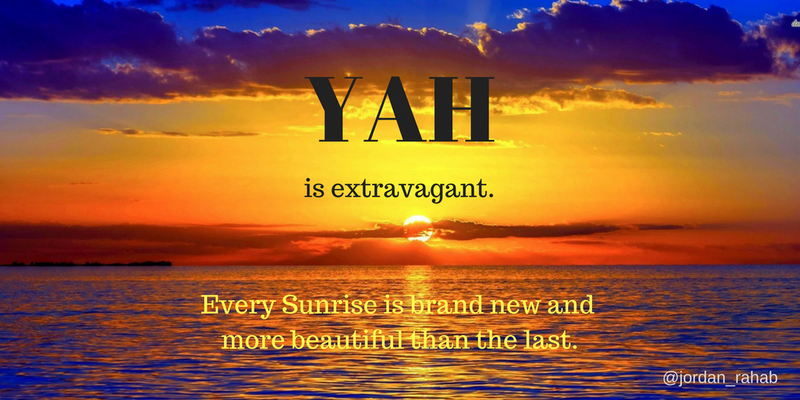 Do you ever thank Yahuah that things are as well as they are, realizing that they can always be worse? And do you understand that the reason your life circumstances are not worse is because of YAH's mercy? What about the things we take for granted? Those daily gifts we wouldn't be able to live without? The air you breathe, the water you drink, the food you eat, and what about the ability to walk, talk, hear, see and feel? How about your sanity? Are you thankful for having a stable mind in a world of such confusion and instability? We could go on and on with YAH's goodness and mercy and the gifts that deserve our daily gratitude. Or maybe you are of those who believe saying 'thank you' once is enough. Perhaps that would be true if no other gifts are given. But given that each day is new, along with each sunrise, it's clear that a genuine 'thank you' is warranted with every waking day. His mercies are new every morning! Use the comment section to write something you're thankful for TODAY. To YAH belongs the glory and the praise.